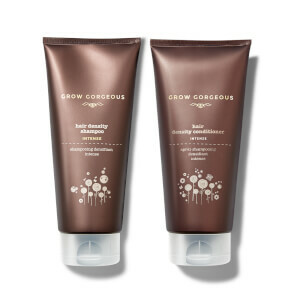 Grow Gorgeous' Ultimate Volume Set combines a trio of body-building hair treats to leave fine, limp hair with a fuller, more voluptuous appearance. The shampoo, conditioner and hair mask work in synergy to promote full-bodied, luscious-looking locks. An intensive deep conditioner that works its magic in just ten minutes, utilising an advanced combination of Biotin and Hyaluronic Acid to hydrate and nourish, effectively filling in sparse fibres within each hair follicle to promote a thicker, fuller appearance. Caffeine and Menthol provide a tingly, cooling sensation that helps stimulate blood flow in the scalp, encouraging healthier looking regrowth and revitalised body. Perfect for when your hair needs that little extra TLC, the hair mask results in lustrous, replenished tresses with gorgeous shine and supple movement. Free from parabens and sulphates. Masque: Massage a generous amount into your scalp. Leave on for 10 minutes or more if desired. Rinse thoroughly. Masque: Aqua (Water), PEG-8, Ethoxydiglycol, PEG-4, Parfum (Fragrance), Caffeine, Polyacrylate Crosspolymer-6, PVP, Maltodextrin, Dimethyl Isosorbide, Tocopheryl Acetate, Zinc Gluconate, Biotin, Ahnfeltia Concinna Extract, Sodium Hyaluronate Crosspolymer, Rosmarinus Officinalis (Rosemary) Leaf Oil, Menthol, Menthyl Lactate, Glycerin, Urea, Ethylhexylglycerin, Hydroxyethylcellulose, Xanthan Gum, Hexylene Glycol, Caprylyl Glycol, Dicalcium Phosphate, Pentylene Glycol, Chlorphenesin, Phenoxyethanol, Linalool, Limonene.